Wait, hold up -- before you sprint down to your Verizon store (sprint... Verizon... never mind) to pick up that catchily-named Gateway LT2016u that just launched, you might want to mull over the next batch of netbooks primed to hit the carrier's outlets in the coming days. 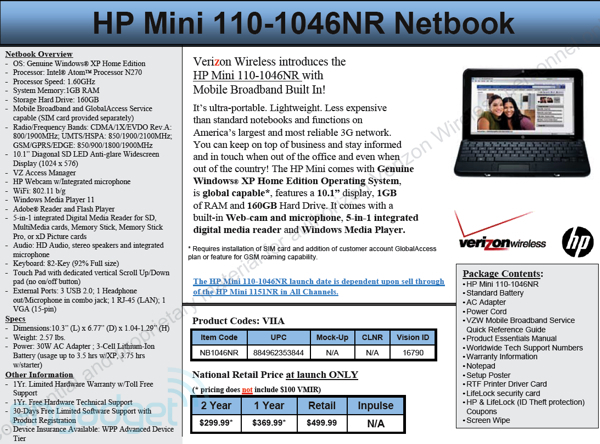 Subsidized netbooks still haven't proven themselves as viable products -- at least, so long as they're not subsidized down to $0 -- but Verizon's ready to keep on trying with the launch of a global 3G-equipped HP Mini 311 on October 22. Sickeningly, they want a full $249.99 on contract after $100 mail-in rebate -- but in exchange, you'll be getting ION, Windows 7, 1366 x 768 resolution on a 11.6-inch display, and a 1.6GHz Atom N270. Moving on, the carrier's current Mini 1151 will ride off into the sunset and be replaced by a Windows XP-equipped Mini 110 featuring a 160GB hard drive and 1GB of RAM; it'll launch once 1151 stock is depleted for $199.99 after rebate with a new two-year deal. Follow the break for details and specs on the 110 (spoiler: it's like pretty much every other 110, but with more voodoo subsidy math).